Expressing rage over the photographs, India is issuing a strongly worded demarche to the Palestine government. 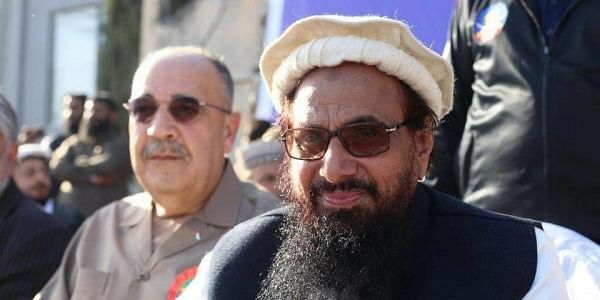 NEW DELHI: India reacted sharply on Friday after the picture of Palestinian Ambassador to Pakistan attending a rally organised by JuD chief and mastermind of Mumbai terror attack Hafiz Saeed surfaced. "We have seen reports in this regard. We are taking up the matter strongly with the Palestinian Ambassador in New Delhi and with the Palestinian authorities," the spokesperson of Ministry of External Affairs (MEA) said in a statement. A photograph of Palestine's Pakistan envoy Waleed Abu Ali sharing a platform with JuD chief at a rally in Rawalpindi is doing the rounds on the social media. Saeed is designated as a global terrorist by the UN and is accused as the mastermind of the Mumbai 26/11 attacks that claimed 166 lives. The global terrorist carries a bounty of 10 million USD (approx. Rs 66 crore) and continues to exercise a lot of influence in religious circles. He has recently been released from house arrest after a Pakistani court cited lack of evidence against him in Mumbai attack case. India has protested against Pakistan time and again for 'harbouring a terrorist' like Saeed.